A popular monument in India, India Gate stands majestically, presenting an awe-inspiring sight. Formerly known as Kingsway, India Gate construction was completed in 1931. India Gate Delhi has been a symbol of sacrifice and dedication of India soldiers. Designed by Edwin Lutyens, it was constructed in the honour of 90,000 Indian soldiers who lost their life in the World War I. Also known as India War Memorial, it also has 13,516 names of Indian and British soldiers engraved on its arch and foundations. These soldiers lost their lives during the Afghan War of 1919. Amar Jawan Jyoti, which is also an important part of India Gate, was built later as a tribute to Indian soldiers who laid down their lives in the Indo-Pakistan War of December 1971. With a height of 42 meters and impressive structure which is accompanied by the captivating surroundings, India Gate attracts hordes of visitors every day. The popularity of India Gate can be known from the fact that it is an integral part of every Delhi tour since bygone eras. Located at the end of Rajpath, it has now become a popular recreational spot with choices of activities as varying as boating, sightseeing or relaxing. 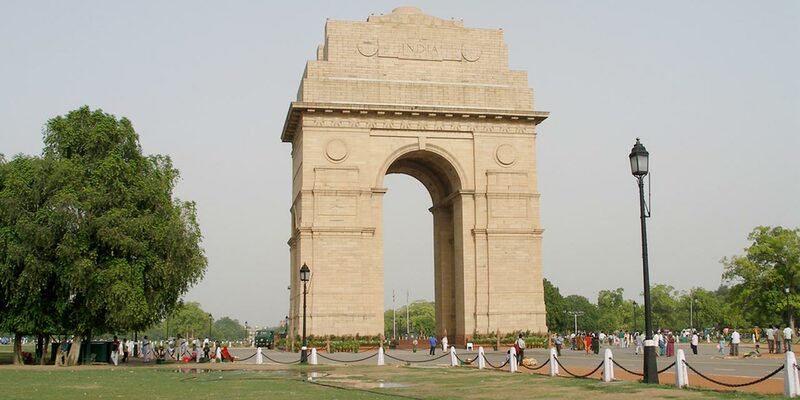 Making your visit to India Gate even better are the India Gate lawns which serve as perfect picnic spot for visitors. Many tourists can be seen relaxing and enjoying their time within the complex of India Gate. There are also plans to construct a National War Memorial near the India Gate canopy along with a National War Museum close to the Princess Park. As per some, canopy near the India Gate, which was also designed by Edwin Lutyens, underwent a small change. A marble statue of King George V was kept under the roof of canopy. Later the statue was removed from here and moved to Coronation Park. Names of soldiers who scarified their lives for the country have been inscribed on India Gate. However, due to security reasons, reading the names is not possible. These names also included that of a female nurse of Territorial Force who lost her life in 1917. TO THE DEAD OF THE INDIAN ARMIES WHO FELL AND ARE HONOURED IN FRANCE AND FLANDERS MESOPOTAMIA AND PERSIA EAST AFRICA GALLIPOLI AND ELSEWHERE IN THE NEAR AND THE FAR-EAST AND IN SACRED MEMORY ALSO OF THOSE WHOSE NAMES ARE HERE RECORDED AND WHO FELL IN INDIA OR THE NORTH-WEST FRONTIER AND DURING THE THIRD AFGHAN WAR. The importance of India Gate is not only as a war monument, but more than that. It still holds high significance. Republic day at India Gate is one such activity that shows the prominence this structure holds in the country. It is visited by Indian President every year on the Republic Day, on 26th January. President of India pays his homage to the Indian soldiers who fought for the country by placing a circlet at Amar Jawan Jyoti which is located under the India gate arch. It is then followed by the India gate Independence Day parade which moves towards the Rajpath. This splendid India gate parade is done by contingents, school children, folk dances, army weaponry, etc. 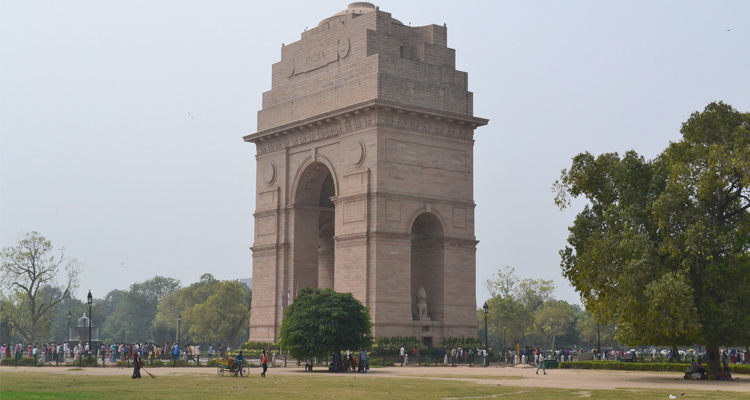 India Gate War Memorial was built as a work of the IWCG (Imperial War Graves). IWCG was created to build war memorials and graves for the soldiers who were killed during World War I. The foundation of this war memorial was placed in the year 1921 by the visiting Duke of Connaught. It took around 10 years for the construction of Dilli India Gate. It was inaugurated in February 1931 by Viceroy Lord Irwin. This 42 meter high war memorial standing like an archway in the centre of a crossroad is representative of the sacrifices of the Indian soldiers. It was built in the honour of around 90,000 soldiers who scarified themselves in WWI in various parts of the world like Mesopotamia, France, Persia, East Africa, Flanders, Gallipoli and other places. India Gate History shows that this war memorial is not associated only with the soldiers who lost their lives in World War I but also those who sacrificed themselves in North western Frontier in the 1919 Afghan war. Names of around 13,516 from Afghan War are also inscribed on the memorial. In 1971, a new addition was made to India Gate Delhi. Amar Jawan Jyoti burning since the year 1971, honours the soldiers who laid down their lives while fight for the country during Indo-Pakistan War. It was inaugurated in 1972. A look of it is enough to explain the Biography of India gate. Its architectural style represents the essence of this war memorial. India Gate Delhi was constructed in the year 1931 while the foundation stone was laid out in 1921. The founder of India Gate is Sir Edwin Lutyens, who designed this marvellous piece of architecture. Architectural style of India gate is often compared to the Gateway of India in Mumbai, Arch of Constantine of Rome and Arc De Triomphe of Paris. The architectural style of India Gate is also similar to Cenotaph, in London which is free of any religious association; hence one can see there are no religious or cultural ornamentation on this architecture. It is a secular war memorial. The height of India Gate is 42 meters, standing on the eastern end of Rajpath. The stone used in India Gate is red Bharatpur stone. The war memorial stands on a base made up of this stone. It then rises into stages to its present structure. The entire complex of India Gate is in the shape of hexagon, covering an area of 306,000 sq. Meter. The complex is surrounded by lush green gardens. Towards eastern side of India gate, around 150 meters away, is the 72 feet long canopy. Said to be inspired by the 6th century old pavilion from Mahabalipuram, this domed canopy is supported by four columns. Under the ceiling, there is a pedestal with GEORGE V R I inscribed on it. There used to be 50 foot tall marble statue of King George V under the canopy. In 1960, the statue was later removed and placed along with other British era statues in Coronation Park. Amar Jawan Jyoti is a national monument which honours the brave soldiers of the country. After the 1971 India Pakistan War, also known as Bangladesh Liberation War, Amar Jawan Jyoti was built beneath the India Gate archway. It was built in the memory of soldiers who sacrificed their lives during the war. Amar Jawan Jyoti which is also referred as the “Flame of the Immortal Soldiers” is a simple structure, with pedestal made up of black marble. On the marble stand, a reversed rifle has been placed which has a helmet on it. This rifle is surrounded by undying flames on all the four sides. On both the sides of the memorial, words “Amar Jawan” meaning immortal fighter, has been carved in gold. As a tribute to all the soldiers, these eternal flames have been burning ever since its construction. Also known as the Tomb of the Unknown Soldiers Amar Jawan Jyoti was inaugurated by the then Prime Minister of India Indira Gandhi on the eve of Republic Day. Garlands are placed on the Amar Jawan Jyoti on Vijay Diwas, Infantry Day and Republic Day. Dilli India Gate is surrounded by refreshingly green lawns and shimmering waters of a lake. India Gate complex not only boasts of beautiful fountains, garden, canals but an exciting opportunity of boating as well. There is boat club which offers boating choices of pedal boats and row boats at reasonable prices. The boating charges at India Gate is Rs.50 per person for a ride of 15 minutes while for a 30 minute boat ride, the charges are Rs.100 per person. It is open on all days of the week. Although India gate boating timings are from 2 PM to 9 PM, boating at India Gate is especially popular in evenings when the weather is comparatively cooler. From couples to families, everyone can be seen enjoy a boat ride on the serene lake while having a mesmerising view of the majestic India Gate war memorial. Another popular place adjacent to the India Gate Memorial is the Children Park. Spread over an area of around 10 acres of land, Children’s park at India Gate is an ideal place for families to visit. Beautiful landscapes, view of the India Gate memorial and a wide array of activities for Children make this a perfect place for everyone. Along with aquarium, jungle book theatre, amphitheatre, hi-tech games and musical fountain, there is also a library inside the park with a minimal charge for membership. Opening timings of the library is from 11 AM to 5 PM on all days of the week, except on Sundays while the timings of Children’s Park is 10 AM to 8 PM. The entry to the park is free. India Gate Delhi is much more than a war memorial. Presenting an imposing architectural beauty, it captivates everyone. The sight is all the more alluring in evening when the memorial and the surrounding area is lit up with innumerable lights. Light show at India Gate is something that one mustn’t miss when on a tour to Delhi. The view of India Gate glittering in lights which is enhanced by the nearby fountains adorned in colourful lights is breath-taking. Plan a visit in evening for a wonderful view of India gate Lighting. Timings of light show at India Gate are from 7 PM to 9.30 PM throughout the week. India Gate Memorial is open all day and night. It is opened every day for visitors. However, many visit this memorial during evenings when it is lit up in colourful lights. During evenings, especially on weekends, the complex is filled with hawkers and stalls and tourists who can be seen relaxing in the surrounding gardens. No entry fee is charged for visiting this war memorial. There are regular DTC buses to India Gate from all the major parts of Delhi. Another popular and faster way to reach India Gate in Delhi is via metro. Central Secretariat Metro Station on the yellow and violet line is the nearest station to the memorial. The station is only 2 km away from India Gate. From the station, you can either take an auto-rickshaw or even walk down. The distance between Red Fort and India Gate is around 8 km which can be covered within 15 minutes of time. Rajpath: Rajpath is a stretch of road which is around 5 km long. This broad road runs between India Gate Memorial to the Rashtrapati Bhawan. The road is wide and kept clean with green lawns and ponds on both the sides, making it a pleasant path for walks. Rashtrapati Bhawan: The impressive structure of Rashtrapati Bhawan is another place to see near India Gate. The official residence of the President of India, it comprises of around 300 rooms with a durbar hall where the official functions are organised. Central dome, resembling the Sanchi Stupa, is one of the most attractive features of this building. Parliament House: Located only 2 km away from India Gate is the Parliament House, the place where all the representatives of the country meet. This historic building is the place where power was transferred back to India by the British in the year 1947. Jantar Mantar: A popular tourist attraction in Delhi, Jantar Mantar is also located quite close to India Gate. It is around 3 km away from the war memorial. Proud of being the oldest astronomical observatories in the world, this structure is worth a visit. Built in 18th century, it showcases the technological advancement during that period. Gurudwara Bangla Sahib: Around 2.7 km away from India Gate war memorial, Gurudwara Bangla Sahib is a highly religious place for devotees of Sikhism. It is the place where the eighth Sikh Guru, Guru Hari Kishan has stayed on his visit to Delhi in 1664. National Gallery of Modern Art: Located just 1 km away from India Gate Delhi, this gallery of modern art can be reached within 5 minutes. It showcase an impressive collection of paintings and sculptures of various Indian and international artists. National Museum of Natural History: National Museum of Natural History is a popular museum near India Gate. This museum is situated at a distance of 2.3 km from India Gate. Consisting of various theme based galleries, it is an educational and entertaining place that is worth a visit. India Gate is built by architect Edwin Lutyens, who was also considered as the chief architect Delhi. When was India Gate built? The foundation of India Gate was laid in the year 1921 by Duke of Connaught. The construction of the memorial took 10 years and was completed in 1931. In which year India Gate was Built? India Gate Delhi was built in 1931 while the construction was started in 1921. Where is India Gate in Delhi? India Gate is located in Rajpath of New Delhi. What is the Height of India Gate in Delhi? The height of India Gate is 42 meters. Who is the Architect of India Gate? The Architect of India Gate is Edwin Lutyens. What is the Significance of India Gate? India Gate Delhi is a war memorial which has been built to honour the Indian soldiers who were killed while fighting for the country. It is also place from where Republic Day parade moves to Rajpath. It is visited by all prominent Indian leaders and also international leaders on their official visit to pay homage to the great sacrifices of Indian soldiers. India Gate is a war memorial which was built in 1931 as a tribute to the soldiers who lost their lives for the country. It is one of the largest war memorials in the country. What is written on India Gate? Is there a Car Parking facility near India Gate? Yes, there are parking facilities quite close to the India Gate. Free parking is available on Rajpath. There is parking space near the KG Marg and Children’s Park at India Gate. However, officials sometimes change the parking location so it is advisable to first get the exact location of parking before going to India Gate. What material is used to build India Gate? The material used in construction of India Gate Delhi is red Bharatpur stone and granite while the plinth of Amar Jawan Jyoti is built with black marble.